Nobody ever thought the window for a two-state solution would ever truly close — or be closed. Benjamin Netanyahu just declared it so in a last-ditched attempt to rally his base ahead of elections. Forget whatever temporary crisis Benjamin Netanyahu created with the United States in his campaign speech on the Hill. If Netanyahu is re-elected on Tuesday, Israel is going to have a much more serious problem with Europe. In an interview with Israeli news site NRG one day before elections, the prime minister made clear what he has only hinted at and skirted around for years. The interviewer wasn’t going to have it. “If you are prime minister, a Palestinian state will not be established?” he asked. And therein lies the problem. The very foundation of Netanyahu’s strategy vis-a-vis the Palestinians and the international community has been to stall, to muddle, to talk the talk but not walk the walk. His strategy has paid off thus far. Nobody in the world fully believes that Netanyahu ever earnestly went all-in to peace talks, but as long as the process continued, as long as there was a chance, the gravest consequences of Israel’s intransigence have been held at bay. In Brussels last year senior EU bureaucrats crafting Europe’s policy in the Middle East made clear to me that the ongoing peace process was the only thing stopping them from implementing what can only be described as sanctions. Last year, the idea seemed fantastical. No-one — neither diplomats nor analysts — believed the Israeli side would ever say say ‘game over.’ But things have changed. 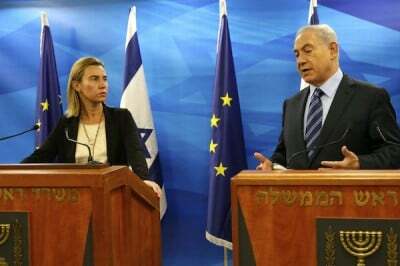 And it is important to note that Europe is Israel’s largest trading partner, which gives it tremendous influence. Netanyahu’s declaration, should he be re-elected, would also provide the Palestinian Authority with reasons beyond reproach to move ahead in the United Nations and other international institutions. This will make things a bit awkward for the United States. How can it continue to veto anti-settlement resolutions in the UN Security Council if the Israeli government’s official position is that Palestinian statehood is off the table — that the West Bank belongs to Israel and not the Palestinians? Would an International Criminal Court investigation into Israeli settlements as a war crime be emboldened by a newly unabashedly settler government? We’ll find out in a few days.